Reinforcing bars – an absolute essential for the construction industry. Without these, not much building can be done. 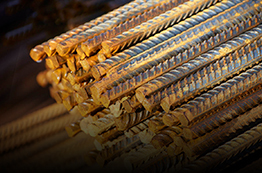 Reinforcing bars – an absolute essential for the construction industry. Without these, not much building can be done. Here are the whys and wherefores about why they’re such a vital tool for anyone working in this sector. Quite simply, a reinforcement bar – or rebar, as it is often referred to – is typically formed from carbon steel and is used to help strengthen concrete and absorb any tension that may be present. It is typically used in reinforced masonry and concrete, and comes with ridges that help it to bind to the concrete. Concrete structures used to be unreinforced but rebars have been in use in the construction industry since around about the 15th century. They have been used in the construction of famous buildings such as the Chateau de Vincennes, for example, as well as the Leaning Tower of Nevyansk in Russia. While concrete itself is quite strong in compression (the application of balanced pushing forces in varying points on a structure or material), it is quite weak in comparison with regards to tension. In order to compensate for this, rebar is cast into the concrete to help it carry the tensile loads.